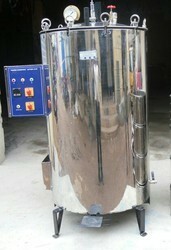 We are a manufacturer, supplier & dealer of Lab Autoclaves. Being a customer focused organization, we are engaged in offering a wide and exotic assortment of Lab Autoclaves. Our proficient experts ensure to design this range in adherence to the fixed industrial standards. These lab autoclaves are available in different forms as per the varied specifications detailed by the customers. This range is widely utilized in different areas like medical, agricultural, industrial, research laboratories and hospitals. The Unit has spring loaded safety valve for pressure adjustment and a dead weight safety valve. Autoclave is hydraulically tested up to 30 psi. The unit is fitted with electrical fittings, chord and plug.